The Swift Parrot Lathamus discolour is a specialised nectar and pollen feeding parrot that migrates across Bass Strait from summer breeding areas in Tasmania to winter feeding areas on mainland Australia with important sites in Victoria. The Swift Parrot is the sole member of the genus Lathamus and is unusual in that it has some similar characteristics to both Lorikeets and Parrots (Psephotus and Platycercus). It has a specialised brush tongue for nectar and pollen feeding, long slender wings for rapid flight and a long slender stiff tail similar to Lorikeets but a smaller non-protruding bill and feather patterns more similar to those found on the broadtail parrots (Brown 1989). The Swift Parrot is about 25 cm in length; some obvious features include a bright green glossy appearance with red around the bill and throat to the base of the neck with yellow margins. Shoulders and underwing coverts are bright red, primary coverts blue. Females and juveniles are generally duller with less red and yellow on the face and throat. The call varies according to behavioral patterns with the alarm call being a high pitched ‘clink’ ‘clink’ ‘clink’ being rapidly repeated when birds arrive and depart a site. Thirty one locations have been identified in Victoria as being important feeding habitat for the Swift Parrot, these are mainly in the Box Ironbark forests through central Victoria. All known records of Swift Parrot in Victoria. Source: VBA 2019. 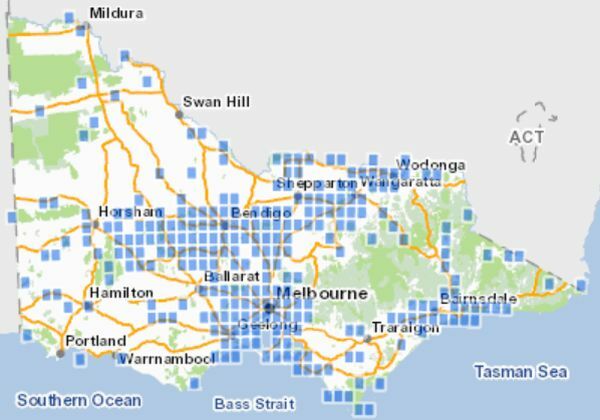 Parks and Reserves managed by Parks Victoria. Deep Lead Nature Cons. Res. Swift Parrots spend most of the year in Tasmania and have been recorded there from August to April, the main breeding season being from October – December, during this time the birds utilise Tasmanian Blue Gum Eucalyptus globulus in the north, east and southern areas of Tasmania. The Tasmanian Blue Gum also provides an important source of food during the breeding season (Hingston et al. 2004). From January there is a general post breeding movement to central and western Tasmania which also coincides with the end of the Blue Gum flowering period (Brown 1989). Migration across Bass Strait can commence anytime from late February onwards. Records suggest the birds make the Bass Strait crossing in small flocks during daylight hours without stopping, a journey which could take about five hours. By May the Swift Parrot is distributed mainly in Victoria and to a lesser extent New South Wales and sometimes southern Queensland where they remain until mid August to September when they begin their return journey back to breeding areas in Tasmania (Brown 1989). Whilst in Victoria, the over-wintering habitat of the Swift Parrot is eucalypt forests and woodlands, particularly the box ironbark woodlands of central Victoria. Areas used by Swift Parrots can change differently from one year to the next and small remnant patches down to 10 ha can become significant elements in the landscape for the over-wintering (Mac Nally & Horrocks 2000). Swift Parrots use their specialised tongue to consume nectar and pollen but to a lesser extent have also been recorded feeding on lerps and psillids in Victoria. It has been found that in Victoria more than 90% of observations were of birds using the winter flowering Red Ironbark Eucalyptus tricarpa, Mugga Ironbark Eucalyptus sideroxylon, Yellow Gum Eucalyptus leucoxylon or Grey Box Eucalyptus microcarpa. Nectar, lerp and other food from eucalypt foliage were frequent dietary items (Kennedy & Tzaros 2005). White Box Eucalyptus albens and Red Gum Eucalyptus camaldulensis have also been recorded as a food source (DSE 2002). They have also been recorded feeding on Swamp Gum'Eucalyptus ovata during flowering, primarily in August in Tasmania (Brown 1989). Although Swift Parrots feed mainly on flowering eucalypts the occurrence of Swift Parrots is not necessarily associated with the amount of flowering in the box-ironbark system but rather more associated with the flowering intensity of the Golden Wattle Acacia pycnantha and to the density of certain species of highly aggressive, nectarivorous honeyeaters e.g. Fuscous Lichensostomus fuscus, White-plumed Lichensostomus penicillatus, and Yellow-tufted Lichensostomus melanops honeyeaters and Red Wattlebird Anthochaera carunculata (Mac Nally & Horrocks 2000). The Swift Parrot can rapidly ingest large quantities of Eucalyptus pollen which is an important source of protein (Gartrell & Jones 2001). It has been found that they are an effective pollinator of the Tasmanian Blue Gum, more so than honeyeaters (Hingston et al 2004). The Swift Parrot population was estimated at 1320 pairs by Brown (1989). Brereton (1996) estimated 1,000 breeding pairs. The most significant threat to this species is the loss of breeding habitat in Tasmania, primarily the harvesting of Tasmanian Blue Gum due to forestry practices including woodchipping. Brown (1989) estimated that only one third of the original Eucalyptus globulus forest remained. The main threat in Victoria is a reduction in the extent of Box Ironbark woodlands which provide a source of winter flowering, nectar and pollen. The conservation status of Swift Parrot was raised from Endangered to Critically endangered in May 2016 under schedules to the EBPC Act 1999. It has been suggested that revegetation programs would benefit from plantings which have an integrated, multi-vegetation-layer approach e.g. 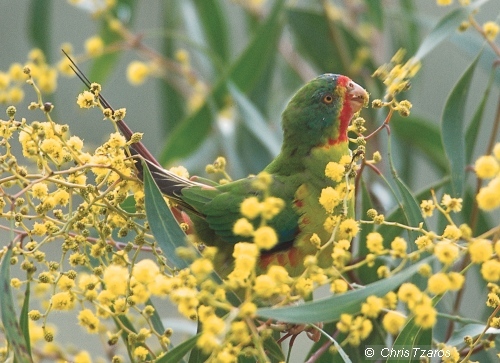 golden wattle are likely to produce better outcomes for many species, but especially for overwintering Swift Parrots (Mac Nally & Horrocks 2000). Special Management Zone requirements for Swift Parrot sites have been provided into Forest Management Plans across Victoria. Sites are managed to protect the key habitat features for Swift Parrots. All larger trees will be protected from harvesting and all activities likely to disturb Swift Parrots will be excluded while the birds are foraging within the areas. Field observations from February to September in Victoria are important to assist in population monitoring. Observations can be sent to SWIFFT and will be forwarded onto the DELWP Victorian Biodiversity Atlas. The Swift Parrot Group recovery group comprises interstate government conservation departments as well as Birdlife Australia. Undertake the annual May and August winter surveys. Conduct regular surveys of well known/used habitats outside the two count periods - coinciding with peak flowering/lerp events. Parks Victoria to ensure that Special Protection Management Areas within conservation reserves are managed to maintain or enhance their value as Swift Parrot habitat. All larger trees will be protected and all activities likely to disturb Swift Parrots will be excluded while the birds are foraging. Parks Victoria fuel reduction burns to be conditioned to avoid impacts to feeding resources. Continue to identify and map the extent of the over-wintering habitat of the Swift Parrot to identify important sites that are used regularly, concentrating primarily on forests and woodlands consisting of winter-flowering eucalypts, based on the approach used by Kennedy and Price (2001). Collect further ecological data (compatible with Tasmanian protocols used by Brereton (1996) on Swift Parrots at foraging sites, especially at post- and pre-migration periods. Data could be collected as part of a post graduate study. Research the movement patterns of Swift Parrots throughout their winter migration, particularly where large concentrations may occur on arrival and departure. Involve local Field Naturalist groups in identifying heavy winter-flowering eucalypts and check for Swift Parrots throughout the winter period. Increase protection of known and potential foraging sites in State Forests where timber harvesting is permitted (Birds Australia (2005) The State of Australia's Birds 2005 - Woodlands and Birds. Determine Special Management Zone requirements for Swift Parrot sites within Box Ironbark Forest. Provide information and maps to LGAs for inclusion in Municipal Strategic Statements and overlays. 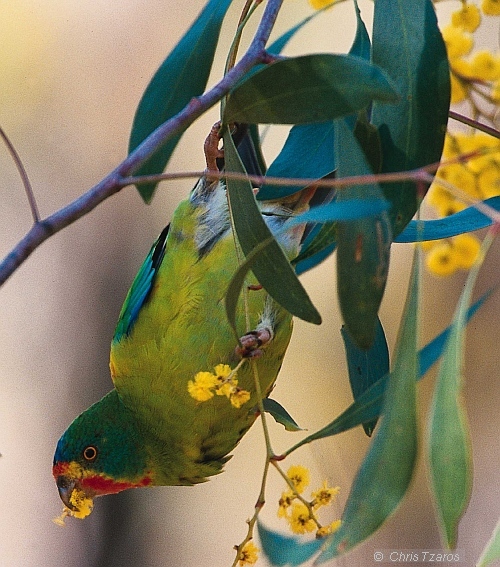 Incorporate information regarding the location and management of Swift Parrot sites into Bendigo City Planning Scheme. Ensure that mineral exploration, mining and extractive industry activities are planned and conducted to minimise impacts on Swift Parrot habitat, especially within Swift parrot Management Areas. Where impacts are unavoidable, ensure that rehabilitation works enhance or restore habitat. Incorporate actions to protect, enhance and restore Swift Parrot habitat into relevant Regional Catchment Strategies or their subordinate strategies via Biodiversity Action Plans. Implement these actions, according to priority, as resources become available. Plan targeted revegetation and regeneration projects to improve remnant vegetation at selected sites used by Swift Parrot to provide more suitable habitat (winter-flowering eucalypts). In 2010 investigations commenced to determine the movement patterns of Swift Parrots throughout their winter migration, particularly where large concentrations may occur on arrival and departure e.g. 100 individuals seen in the Bailieston Historic area feeding on flowering E.tricarpa in 2013. Collect further ecological data compatible with Tasmanian protocols used by (Brereton 1996) on Swift Parrots at foraging sites, especially at post- and pre-migration periods. Completed for Central Victoria - Gary Cheers report for 2005. Brown P.B. (1989) The Swift Parrot Lathamus discolor (White) A report on its ecology, distribution and status, including management considerations. A report prepared for the Australian Heritage Commission, Department of Lands Parks and Wildlife, Tasmania, July 1989. DSE (2002) Victorian Flora and Fauna Gaurantee Action Statement No.169, Swift Parrot Lathamus discolor Department of Environment, Land, Water and Planning Victoria. Gartrell B.D., Jones M. (2001) Eucalyptus pollen grain emptying by two Australian nectarivorous psittacines Journal of Avian Biology 32 (3), 224–230. Hingston A.B., Gartrell B.D., Pinchbeck G. (2004) How specialized is the plant-pollinator association between Eucalyptus globulus ssp. globulus and the swift parrot Lathamus discolor? Austral Ecology 29 (6), 624–630. IUCN (2017) BirdLife International. 2016. Lathamus discolor. The IUCN Red List of Threatened Species 2016: e.T22685219A93064101. http://dx.doi.org/10.2305/IUCN.UK.2016-3.RLTS.T22685219A93064101.en. Downloaded on 02 June 2017. VBA (2019) Victorian Biodiversity Atlas, Department of Environment, Land, Water and Planning, Victoria. Accessed:15 January 2019. The Swift Parrots of Muckleford preview. The Swift Parrots of Muckleford DVD shows footage of Swift Parrots never seen before. Filmed totally in Muckleford, Central Victoria over a five-year period by Debbie Worland, a member of the Castlemaine Field Naturalist Group. The DVD features special comments from former Birds Australia’s Swift Parrot Recovery Co-coordinator Chris Tzaros, and has been narrated by International Award Winner, John Flaus, a resident of Castlemaine. Bill Irwin Productions of Chewton produced the DVD. Email: swiftparrotsofmuckleford@hotmail.com for details.